UFC president Dana White and Michael Bisping both believed Chael Sonnen (Pictured) should have lost on Saturday night inside United Center in Chicago, Illinois. Even Sonnen admitted he wouldn’t have been surprised if the judges’ verdict went in favor of the Brit. “The only round I knew I had was the third,” Sonnen shared at the post-fight press conference. “I thought I might have had one of the first two, but I didn’t know I had it. Prior to hearing UFC announcer Bruce Buffer recite the official scores, Bisping suggested to Sonnen that he thought he was victorious, and Uncle Chael didn’t disagree. White and Bisping believed “The Count” took the opening two stanzas. However, when the cards were all tallied, Sonnen left The Windy City a highly-controversial (30-27, 29-28, 29-28) unanimous decision victory. 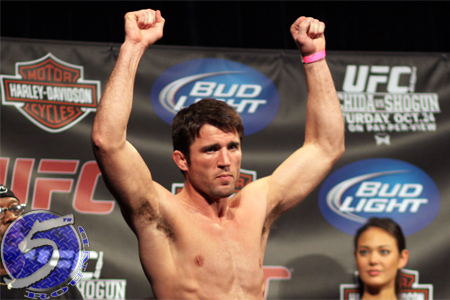 With the win, Sonnen advances to rematch middleweight king Anderson Silva for his crown later this summer. After dominating “The Spider” for nearly five complete rounds at UFC 117, Chael P. Sonnen was caught in a Hail Mary submission with just a few ticks remaining on the clock.